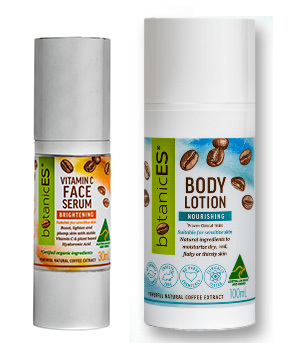 Thanks to botanicES here is your chance to Win one of 2 x Vitamin C Face Serum and Body Lotion Combos valued at $80 each. Vitamin C was the most pinned beauty product on Pinterest in 2017, and its benefits in skincare have been shouted far and wide from celebrities to skin experts. It has been linked to collagen production, neutralizing free radicals and brightening and evening out skin tone, but after extensive research and development, botanicES natural caffeine skincare founder Christelle Tait is not convinced we've been getting many of the benefits. "Interestingly, as an essential vitamin, the skin does not naturally absorb Vitamin C very well," she said. "This means that while a product can contain high Vitamin C, your skin may not necessarily be soaking much of it in. "While Vitamin C itself contains some great properties that could do wonders for your skin, it can easily lose its biological integrity in skincare products as a result of oxidation, heat and interactions with other cosmetic ingredients," Christelle added. Yep! Apparently, every time we take the lid off our Vitamin C bottle, we could be compromising what's inside, and skincare products can actually have high Vitamin C levels - but it all depends on the other ingredients as to how effective it is! "Because of the complexity of Vitamin C, it is a challenge for manufacturers to create a formulation that both hydrates and acts as an anti-ageing solution - it generally does one or the other. But we've found that by using our caffeine formulation as a base, which we know opens the skin barrier for deep penetration, the new formulation actually allows it to do both". Christelle, with her chemical engineer husband Hendrik, spent 2018 working on the botanicES' new Vitamin C Face Serum, building on their current natural caffeine skincare range to develop an award-winning formulation that incorporates their signature natural coffee extract. "Essentially what we've found with the new Vitamin C Face Serum, is that the caffeine component in the coffee acts as a vasodilator, opening the skin barrier to allow two natural stable Vitamin C's, Vitamin E and Vitamin B3 plus the plant based Hyaluronic Acid we use, to penetrate the skin. This is what creates a Vitamin C skincare product that ticks the boxes for both anti-ageing and hydrating properties." With an airless system of delivery to ensure the Vitamin C doesn't oxidise, botanicES is revolutionising the way Vitamin C can benefit our skin. botanicES Vitamin C Face Serum and has just launched at www.botanices.com. Is a natural, organic body moisturiser that penetrates skin deeply to hydrate, radiate and rejuvenate dry skin. Using their exclusive natural coffee extract, the Body Lotion reduces the visible signs of ageing and soothes red, flaky or dry skin. * Q1: Name one of the radio stations that Christine Basil has been a guest on?